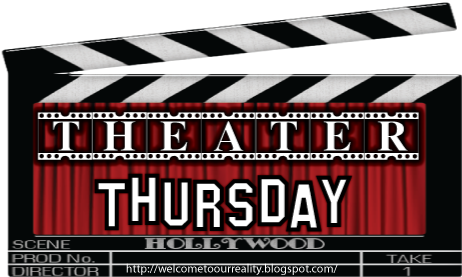 It's Thursday and it's time for this week's Theater Thursday! With this week being Halloween it's a Halloween Edition! This week's featured movie is Halloween! I debated between Halloween and another movie but I had to give it to the classic. Maybe it's the music, maybe it's the mask but this movie still scares the beegeezs out of me! I can't be at home watching this alone without getting scared. 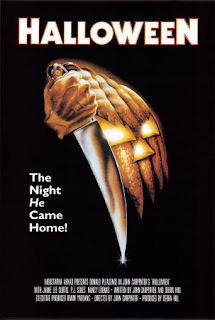 Jamie Lee Curtis stars as Laurie, a high school student who's spending her Halloween evening baby-sitting. Hearing the rumors all day about a small boy Michael Myers who killed his sister 15 years earlier, she's on edge. 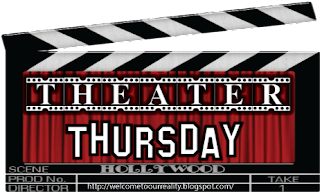 The day begins to go from bad to worse when Michael successfully escapes his mental institution that he's been serving in only to come back to town. With Michael on the loose and almost the entire town out partying the Halloween night away, Laurie (Curtis) will have to fend for herself when Michael comes into the house. Her only hope of being rescued and saved his a doctor who's been treating Michael for years and believes he knows the true evil that Michael is. If you've never seen Halloween, you must get this classic movie and watch it this weekend. Classic. Perfect choice for the weekend. I still remember the first time I saw it, I was young. Too young! I stayed up all night terrified! I LOVE Halloween! I think Michael Myers is the creepiest dude ever. I still love this movie and watch it so much - even when it's not Halloween. Good choice! How can you NOT love Halloween?!?! I seriously love scary movies!!! I watched Halloween 4 & 5 just last night! My favorite scary movies are the Nightmare on Elm Street ones! I am sad to say I have never seen Halloween. I know I know. Maybe I need to this weekend. I think I was always too scared to see it!!! Still not sure if I have actually seen it! Eeek I can't do scary movies!